We showed Winter Hall work-in-progress at an atmospheric Welcome Trust event on 27 October. The academic, gaming and online worlds collided as we discussed plagues, death and games development with a diverse audience and our fellow Developing Beyond finalists. We got some excellent feedback and a chance to test reactions to Winter Hall – if you were there, thank you. Wellcome created the event to showcase the science woven into the Developing Beyond competition and bring it to life. Our stand, complete with paper-cut gothic woodland panorama and plague doctor in full “protective” clothing set the scene, while Winter Hall was centre stage. It was great to feel the buzz in the room and see such interest in all the games. Rob was interviewed by, among others, the Times Higher Education Supplement, the BBC and Science magazine, while the rest of us walked the floor, made connections and practiced our sales pitch. Dr Piers Mitchell, one of our scientific advisers, spoke about the University of Cambridge project, After the Plague, which is looking for answers on how bubonic plague changed the British population. The audience asked “Is bubonic plague still a danger to us today?” and “Do you think there will be another pandemic in the near future?” both of which brought a resounding “yes” from Dr Mitchell. On that (somewhat depressing) note, the competitors joined a panel discussion about the competition, chaired by new judge and eminent historian, Bettany Hughes. This was a great chance to reflect on our Developing Beyond experience and hear what our advisers – and our audience – made of the games. Eleven weeks to go in competition and the stakes are high… now back to work! 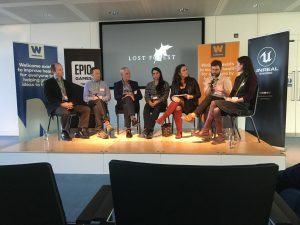 If you met us at the Wellcome event and would like to keep in touch, please contact daisy@lostforestgames.com. We’d love to hear from you.